The Intersection module is MSF’s newest approach to enhancing motorist awareness of motorcycles. The program combines personal stories and character development with a dramatic new look at a crash scene that’s all too common. The DVD contains three separate 13-minute versions to appeal to teens (via driver education classes), adults (via traffic schools), and commercial drivers (via employee orientation). Includes Leader’s Guide, ten Participant’s Guides, and 25 Quick Tips brochures. Bumper Sticker - Your car can kill. 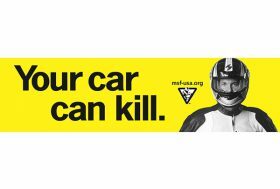 A simple message to motorists that not being mindful of motorcycles on the road can have fatal consequences. Bumper Sticker - Look out for us. Please. Drivers should always keep their eyes open for motorcyclists. 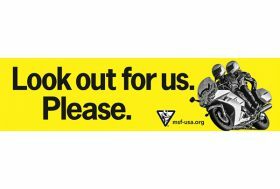 Being alert and aware of motorcycle riders can save lives. The Intersection module is MSF’s newest approach to enhancing motorist awareness of motorcycles. The program combines personal stories and character development with a dramatic new look at a crash scene that’s all too common. The DVD contains three separate 13-minute versions to appeal to teens (via driver education classes), adults (via traffic schools), and commercial drivers (via employee orientation). Includes Leader’s Guide, ten Participant’s Guides, and 25 Quick Tips brochures. This is a 4-minute edit of the three 13-minute videos. This 3-minute edit of the video in the MSF Cars, Motorcycles & A Common Road Kit helps car drivers share the road safely with motorcyclists. Drivers will learn why a safe motorcyclist will ride in various lane positions, the “two-second” rule for following a motorcyclist, and common places where motorists and motorcyclists collide.